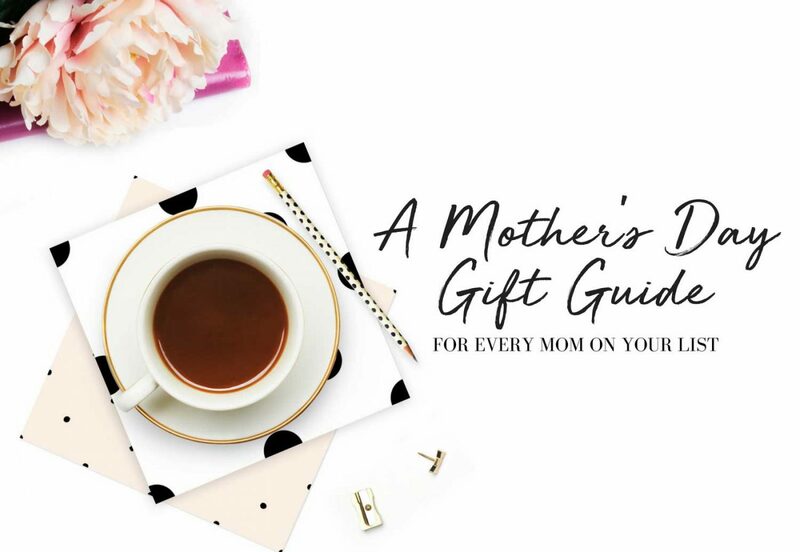 Mother’s Day is right around the corner (Sunday, May 13), and we’ve compiled a gift guide that will help you find something special for every kind of mom in your life. Buy her a cute, new apron. World Market and Sur La Table always have a ton of options that are totally adorable. How about a new band for her Fitbit or Apple Watch? (There are less expensive options on Amazon.) Or, what about some new workout headbands, socks, or hair ties? Maybe she could use new earbuds or an arm strap for her iPhone. Find something she can set on her desk that reminds her of her family. There are some really cute, handmade family portrait options on Etsy. Love this one? Click the image to find one like it! Or, get a personalized silhouette of her kiddo(s) here! If you can swing it, maybe book a family photo shoot (or even a mommy and me shoot for moms with littles). It seems that most moms tend to be behind the camera, so having a nice photo of her with their kids would mean the world to her. You can also create a photo memory via Shutterfly, Chatbooks, or Easy Canvas Prints. Shutterfly always has great promos available when you like them on Facebook, and you can make anything from framed prints and enlargements to personalized jewelry charms, tote bags, and cutting boards. Chatbooks is a quick, easy way to make photo books. Seriously, you can make one in five minutes and the price is right (starting at $8 a book plus free shipping) so it’s really a no-brainer! Easy Canvas Prints is another place to create and buy personalized gifts: from canvases and wood slat prints to blankets and pillows. Amazing quality at great prices—but make sure you sign up for their emails before shopping; they send out awesome discounts! How about making things a little fancier with a french press and/or a coffee grinder? There are endless options on Amazon (thank you for making life simple, Amazon). Chances are she’s traded in her cute purse for the monstrosity that is a diaper bag. Since she carries it every day, why not invest in something that is both practical and pleasing to the eye? Here are a few options: 1. Skip Hop’s Chelsea Downtown Chic Diaper Satchel in black is for a woman who loves the practicality of having the traditional diaper bag and its many pockets (plus insulated side pockets for bottles or snacks)—except this one is a lot classier looking. I love the all black with gold zippers and detailing. You can get this at Target, Babies R Us, and Amazon. 2. The Fawn Design backpack is perfect for a mom who loves having her hands free, plus it is super cute. You could easily mistake it for a chic backpack or a messenger bag, because it can be worn either way. They currently have five different colors, but my personal favorites are black and brown. This one you must order online at their website. 3. If you’re really looking to splurge, go for a gorgeous Lily-Jade bag. You can’t go wrong with its premium full grain leather that comes in a variety of styles and gorgeous colors. These can also be worn as a purse or backpack, and you can easily remove the inside lining that holds all of baby’s needs to quickly transform it back into a functioning purse while keeping all of baby’s diapering essentials together and organized (this also makes it easy to clean.) My personal favorite is the Madeline in Camel & Jade (pictured below), but you truly cannot go wrong with any choice you make! Lily-Jade is not available in stores, so you’ll have to go straight to their website to place an order. Make her a themed gift basket. You could do a tea party theme and include a teacup, a few sachets of tea, a strainer, a nice tea towel, and a candle—if you can really splurge maybe include an electric tea kettle! Or you could create a “spa day” and include a face mask, candle, hand lotion, bubble bath, and nail polish. Purchase a gift from a company or organization who makes an impact on our world. Click on these two articles for shops to consider: Three Cords Haiti: Life Transformation For At-Risk Women and 7 Brands That Are Helping Women Around the World. Speaking of a good cause, we love the shop, Whatever Is Lovely, because not only can you buy this beautiful “Adopt” necklace, but 20% of every purchase goes directly to families who are in need of financial assistance to complete their adoption. Unless you’ve been living under a rock, you’ve heard of Lula Roe. Their tagline is “Where Fashion Meets Comfort”—and all of the busy moms are obsessed. If for some reason you don’t know an independent retailer, you can find one here! Does your mom love makeup? You should consider gifting her with a subscription to Birchbox. She’ll receive a monthly delivery of five beauty products picked just for her. It costs only $10 a month (with free shipping) and you can choose between a 3-month, 6-month, or 12-month subscription. Promptly Journals are a great way to record all of the meaningful moments of her child’s life and history by providing specific prompts. Bonus: they have a specific journal for adoptive moms too! Get her a gift card to a craft store like Jo-Ann Fabrics, Hobby Lobby, or Michaels so that she can purchase whatever she needs for her latest pinned project. Bonus points: sign her up for one of the classes they offer (and maybe even join her)! In case you didn’t know, book-lovers love the smell of old books. Did you know that you can buy an “old book” scented candle? Or, being a book-lover myself, I would die for one of these rubber stamp embossers. Consider buying her a journaling Bible, with extra space and lines in the margins where she can do some hand lettering or simply write her own notes. Another great gift is a set of highlighters specifically made for thin Bible pages. They won’t bleed through the pages or smear, and you can buy a pack on Amazon for less than $10. Charms, pendant necklaces, mothers rings…any of these would be a hit. Get her something personalized with her kids’ initials or name. If she has a Pandora bracelet, buy her a charm that represents a significant milestone of the past year. The Mommy Tribe is now selling these adorable “I’m The Mama That’s Why” tees with the coordinating “Mama Knows Best” kids tee… She also makes custom family illustrations (and the silhouettes above!). Check out the store—you won’t be disappointed! Essential oils are all the rage. Chances are that you know someone who sells some through doTerra or Young Living, but if not, you can also buy them through Amazon. If she already has a ton of oils, consider getting her a new diffuser. Another item she might like is a Himalayan salt lamp…apparently they are a lot of benefits to having one of these pink rock lamps in your house. Create a new memory! Pre-register the two of you for an activity where you can spend some fun, quality time together. You can do something as simple as getting a pedicure to trying something new like a wine and painting night or maybe even an escape room experience. Well, that’s a wrap on this gift guide. Whomever the mom is in your life—whether she’s your mom, the mom of your kids, your mother-in-law, or the woman who is like your mom—just remember to try and make her feel appreciated, special, and loved. That’s all she really cares about. Enjoy your day of celebrating her!